There are basically two approaches to interacting with, and educating, the horse. They are, The Reaction Approach which strives to elicit a reaction out of the horse, and The Response Approach which strives to elicit a thoughtful response from the horse. The Reaction Approach — The human focuses upon training the horse to do as she is asked or told. It is generally a one way conversation. The horse has no say in what is going on. When the horse does communicate, the human silences her. The Response Approach — The human focuses upon teaching the horse to respond to the human’s requests by using the thinking portion of her brain, and it is a two way conversation. The human allows the horse to express herself regarding what is going on. The human constantly adjusts her interactions in response to what the horse is communicating. Both horse and human are engaged in thoughtful response. The Reaction Approach — The human teaches the horse, and the horse is expected to learn. The Response Approach — The human teaches the horse, and the human learns from the horse at the same time. The Reaction Approach — The human uses pressure, usually in increasing amounts until the horse reacts properly, and then the pressure is released. Pressure creates discomfort in the horse’s mind and/or body which triggers instinctive gut reactions from the horse. The Response Approach — The human does not want to cause the horse discomfort and does not want an instinctive reaction from the horse, and therefore, does not use pressure. The human wants a thoughtful response from the horse. The human teaches the horse using “Show and Tell”. The human “shows” the horse what she wants. The human “tells” the horse what she wants by teaching the horse the difference between yes, good, that’s right, etc. and no, uh uh, etc. and by rewarding even the tiniest attempt on the part of the horse by using verbal praise and/or physical touch (stroking, scratching, etc.). The Reaction Approach — Relies on the horse’s desire to move away from discomfort. The Response Approach — Relies on the horse’s desire to move toward comfort. The Reaction Approach — The human repeats the pressure/get a reaction/release the pressure, until the horse finally consciously understands what the human is asking her to do and can then make the conscious decision to respond properly when asked. The human eventually accesses the mind of the horse through repetitively eliciting unconscious reactions through the application of discomfort. The Response Approach — The human accesses the horse’s mind directly. The Reaction Approach — The human applies techniques to every horse in the same way. 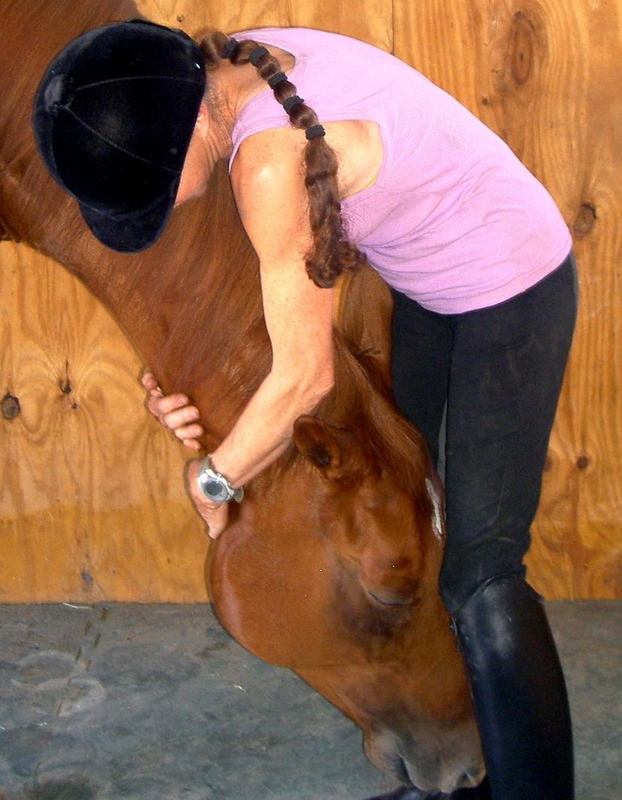 The Response Approach — The human uses techniques as teaching tools, always adjusting them to the individual horse in each individual moment. The Reaction Approach — The human piles on directive after directive without giving the horse time to process and absorb what she has learned before going on to the next request or lesson. The Response Approach — The human regularly gives the horse time to process and absorb what she has learned, as well as to release any tension the horse may have acquired while striving to learn, before going on to the next request or lesson. The Reaction Approach — The human uses a normal and sometimes loud voice with the horse. The Response Approach — The human talks to the horse in a very low voice or whisper. The Reaction Approach — The human attains or regains the horse’s focus by doing things such as snapping or jerking the lead rope, shaking the lead rope, swinging the lead rope at the horse, waving a stick with a flag at the end, tapping or smacking with the whip, backing the horse up and so on. These things put tension in the horse’s mind and body which, to one degree or another, blocks the horse’s ability to focus, learn and accomplish what is being asked of her. The Response Approach — The human understands that a relaxed mind is able to stay focused and learn much more easily and quickly. The human, therefore, strives to attain and maintain relaxation in the horse’s mind and body at all times. The Reaction Approach — Inadvertently reinforces the horse’s instinctive reactions of “act first and think later”. In order to combat this, techniques are used to desensitize the horse in order to make her safe. The Response Approach — As the horse becomes more and more adept at staying in the thinking portion of her brain, she becomes less and less apt to react instinctively. She becomes less and less “spooky” and safer to be around, and because her wonderful sensitivity remains intact, she becomes even more responsive. In addition, as she learns to use the thinking portion of her brain more and more, she becomes increasingly skilled at learning quickly and easily. In order to teach the horse using The Response Approach, you must first establish a connection between yourself and the horse’s mind. In order for this to occur, the horse must be as totally focused upon you as possible. Due to the fact that the horse is a prey animal, her survival depends upon her being aware of everything that is going on in her environment at all times. Since horses are not very good at focusing on more than one thing at a time, she is either focused on you or she is focused on something else in her environment. In order to ignore what is going on in her environment and maintain her focus upon you, she must feel totally safe. The more the horse trusts you as her protector, the safer she feels when she is with you, and the more she is able to give you her full attention. My mare, Sweetie, used to be extremely fearful. She was almost always worried about what was going on in her environment. She rarely relaxed from her job as self appointed guardian. It was impossible to keep her focus on me except for very brief periods now and then. Nowadays, however, when I am interacting with Sweetie, she hardly ever gets distracted by something “out there”. If she does, I gently bring her face back to me and softly whisper “it’s alright, you’re ok”, while I gently hold her closely in a face hug, a head hug, a face to face hug, or a BIG Hug. This comforts her and makes her feel safe which quickly brings her back to relaxation. This allows her to once again focus on me, and we resume. In order to be focused on the human and what the human is asking of her, the horse must be relaxed. In order to be relaxed, the horse must be free of fear. In order to be free of fear, the horse must have total trust in the human as her protector. The key to The Response Approach to interacting with and educating the horse is to first earn her total trust in you as her protector.